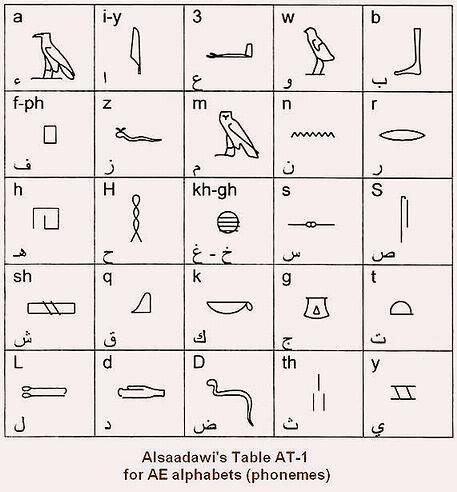 1. one should master reading phoneme letters of in the first table, the corrected table of ossama alsaadawi! 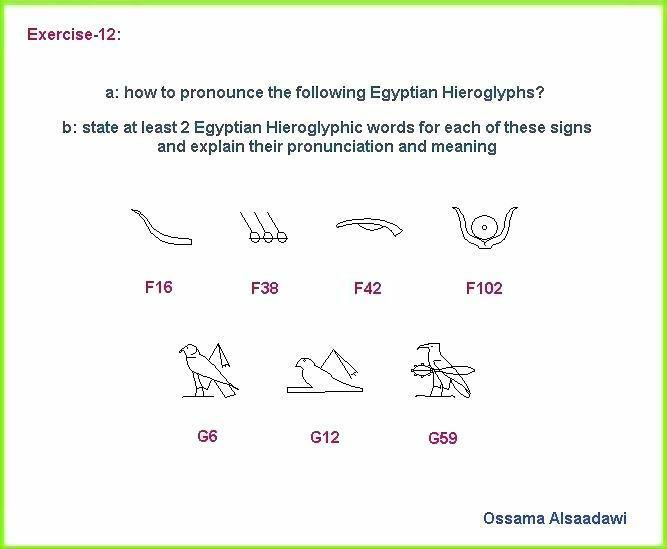 he should stress on the egyptian guttural sounds and master reading them correctly. 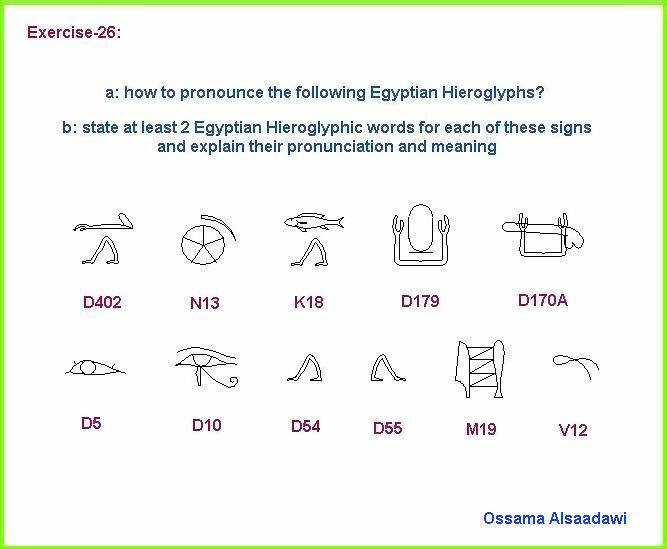 2. one should master reading all bilateral phonetic hieroglyphs according to their correct utterances. 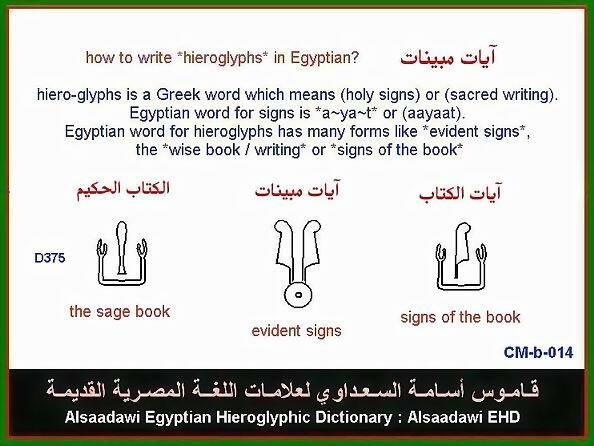 3. one should follow all the strict rules for reading ancient egyptian hieroglyphs. 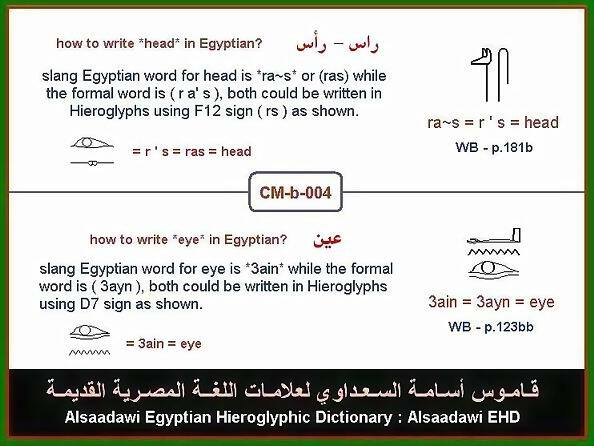 4. one should study carefully correct interpretations of ancient egyptian pictures because they are integrated parts of ancient egyptian texts. 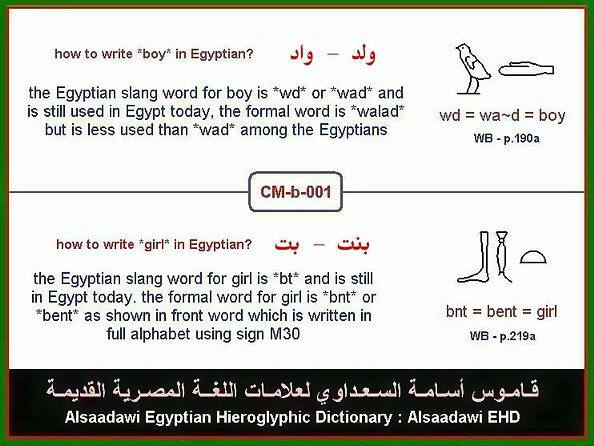 5. studying slang spoken egyptian is a must for learning ae language. 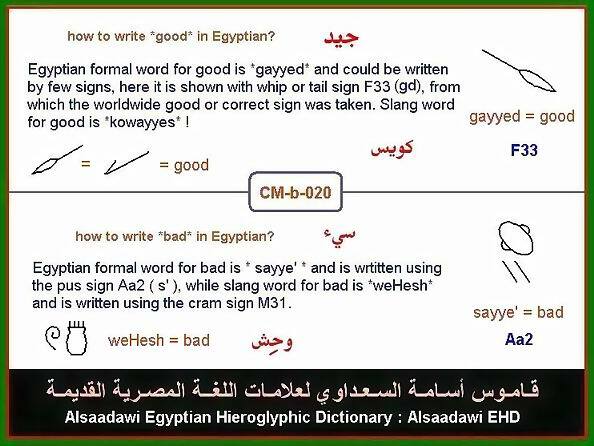 good electronic egyptian or arabic dictionary makes a great help. 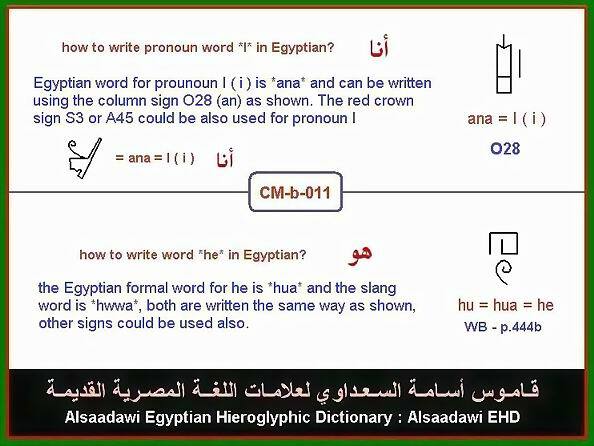 It is very easy to start learning spoken egyptian by learning and mastering reading of all egyptian bilateral phonetic words like ab, akh, 3m, Hr, rb, fr, etc. 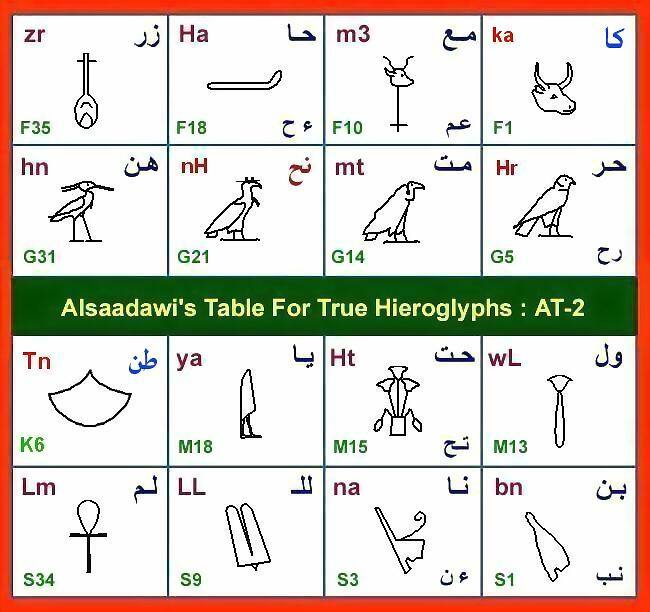 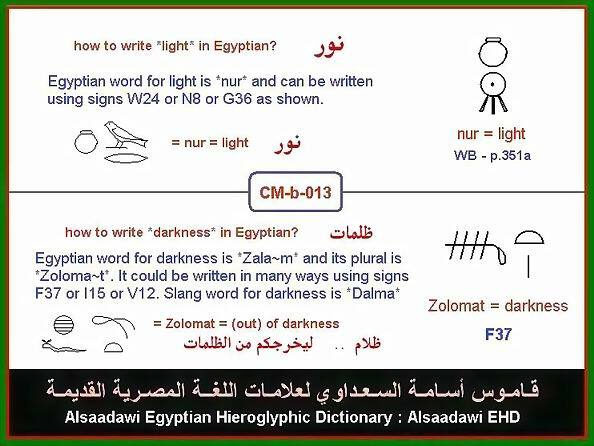 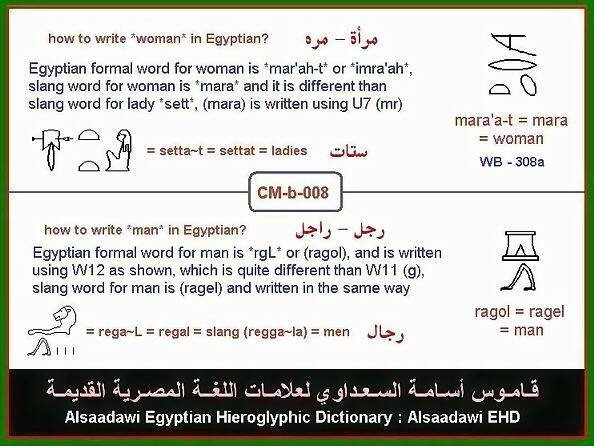 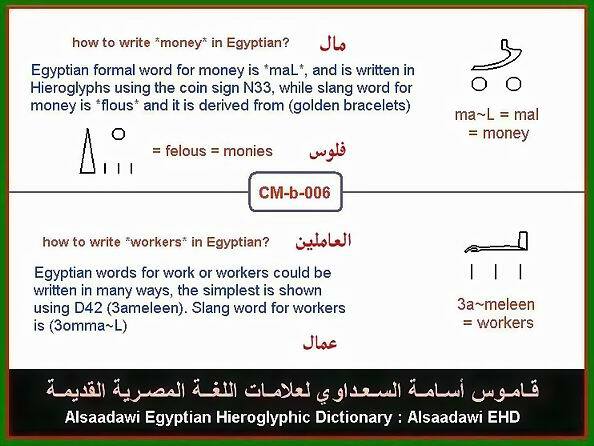 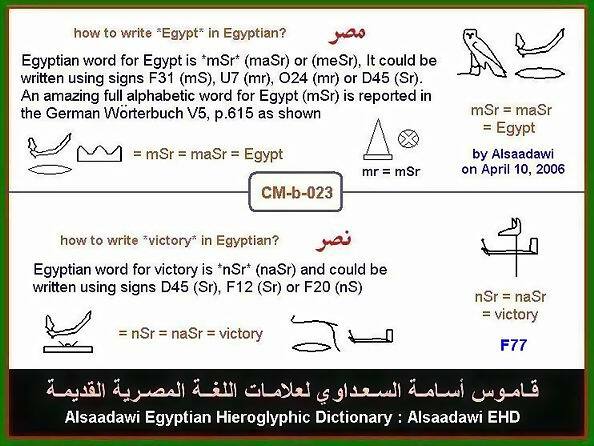 every bilateral egyptian word has a specified meaning and used frequently by the Egyptian peoples who inherited it from their ancient egyptian forefathers. 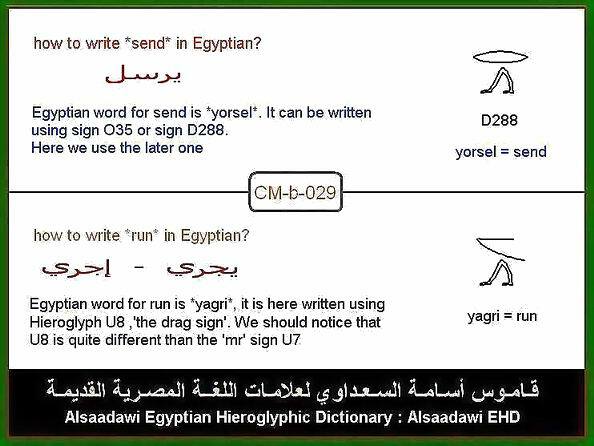 one should be aware that most of traditional deciphering, interpretations and translations of the Ancient Egyptian Hieroglyphic texts were wrong. 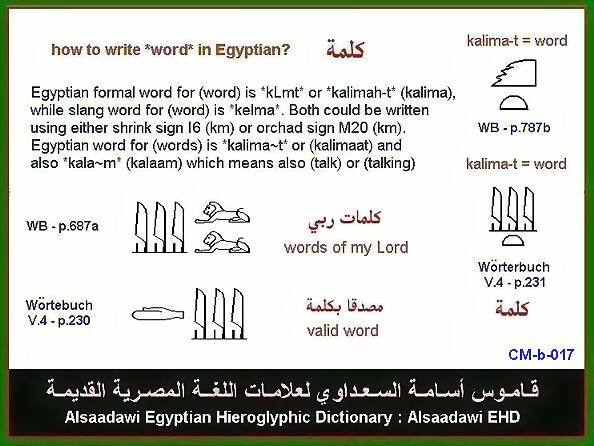 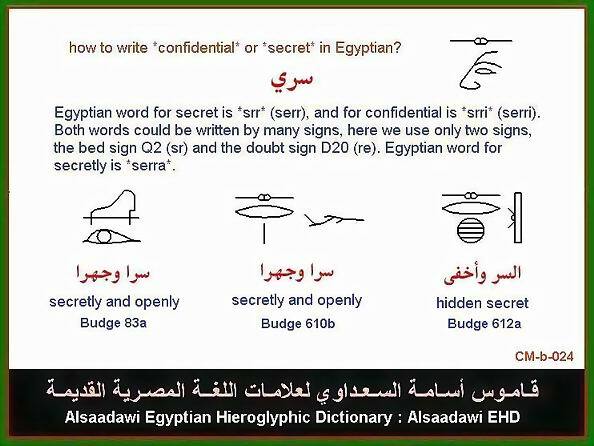 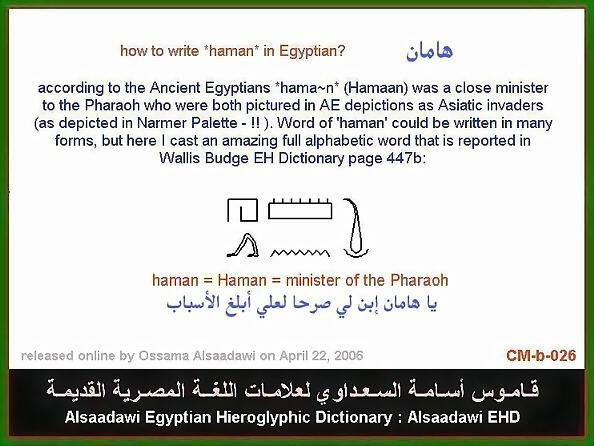 therefore, for correct reading and writing of Egyptian Hieroglyphs one should rely only on the above documents, that is *dictionaries of ossama alsaadawi*. 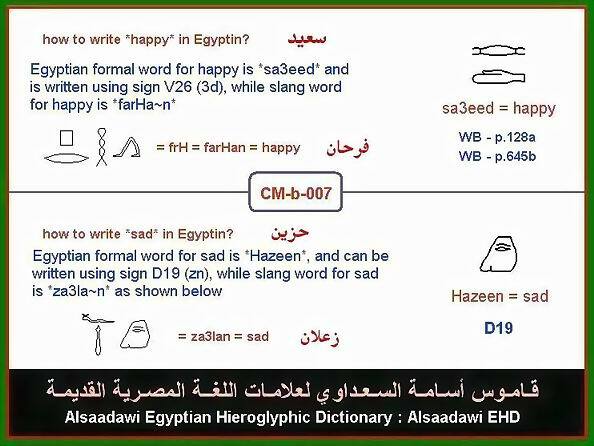 b. an egyptian hieroglyphic dictionary (ehd), by, e.a. 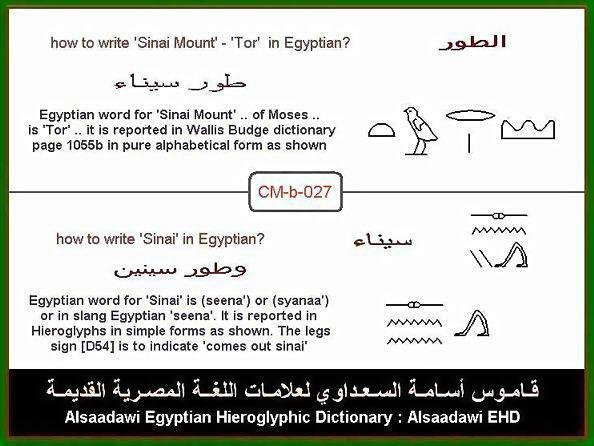 Wallis Budge, i.s.b.n: 0-486-23615-3, comes in two volumes. 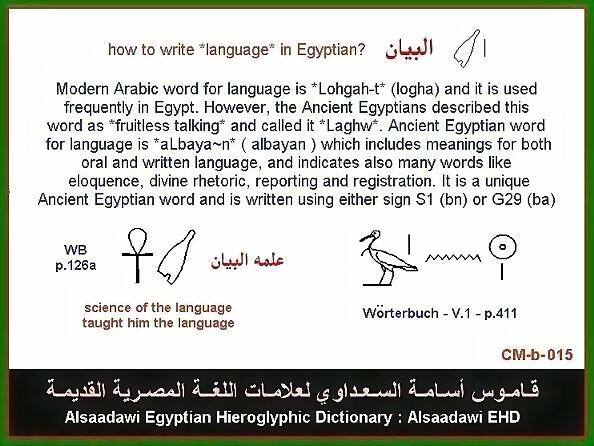 8. one should realize that the spoken egyptian has never changed since very old epochs of ancient egypt and that modern egyptians speak very same like their ancient forefathers did. 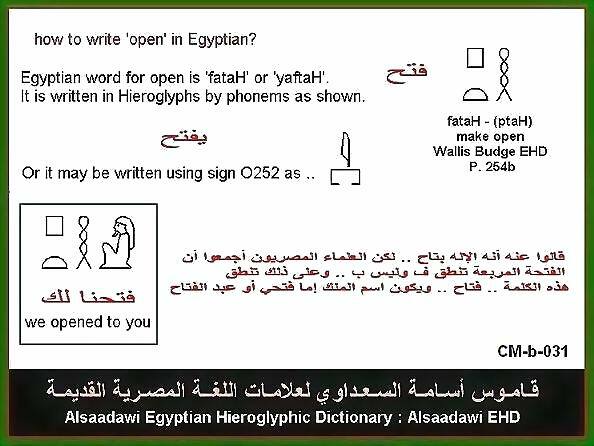 this of course help much in learning ancient egyptian language. 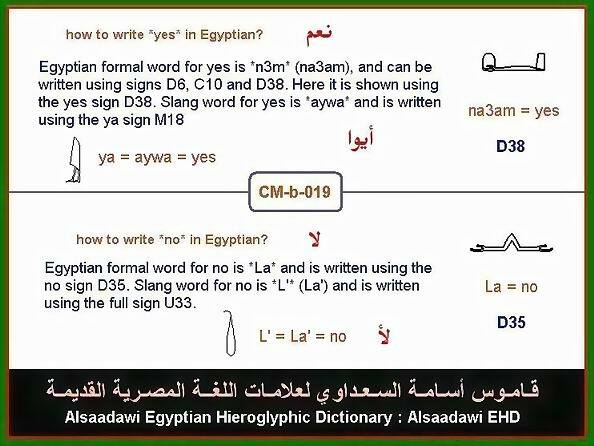 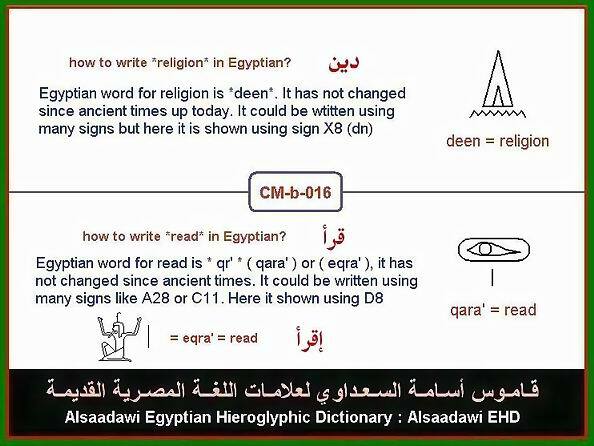 9. one should realize that there is nothing called coptic language. 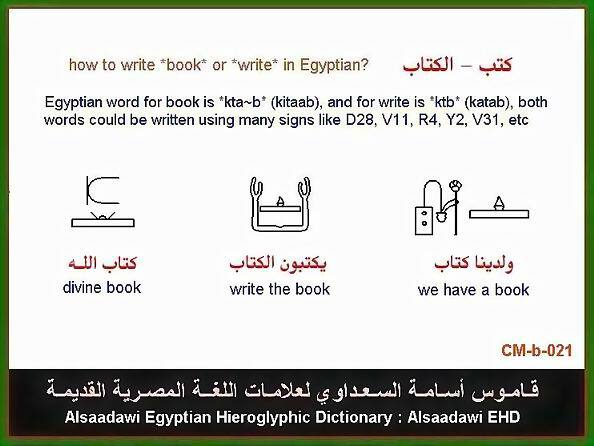 by coptic language savants mean the coptic script or writing line that the copts tried to use in place of the egyptian writing lines during the coptic era (390-640-AD). 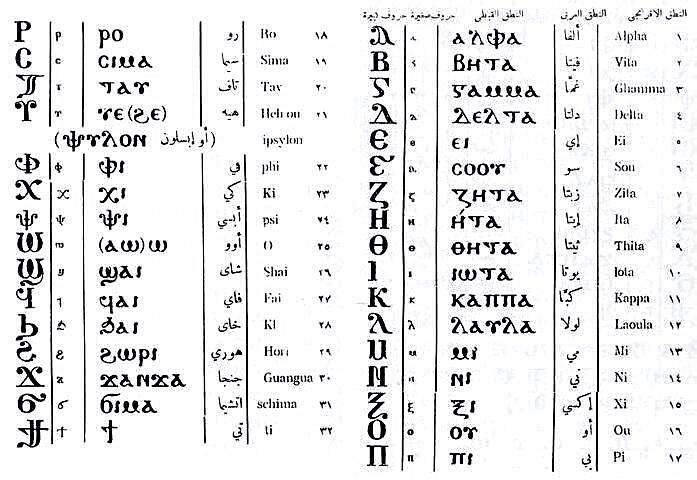 this trial died in its cradle because the coptic script (modified greek) never matched the spoken egyptian and was deserted by the copts themselves. 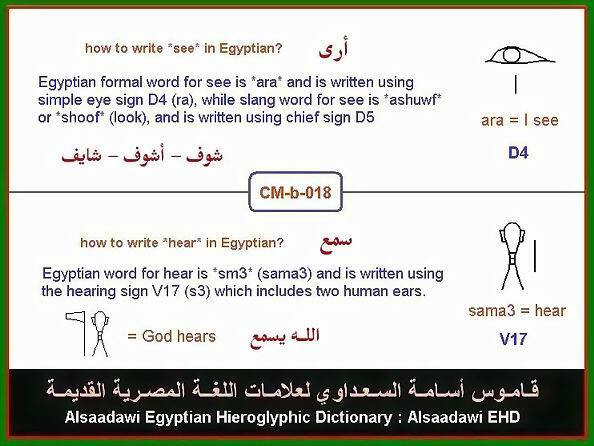 the copts, either the ancients or the modern, speak only the colloquial egyptian which is prevailing in all epochs of the egyptian history and up today. 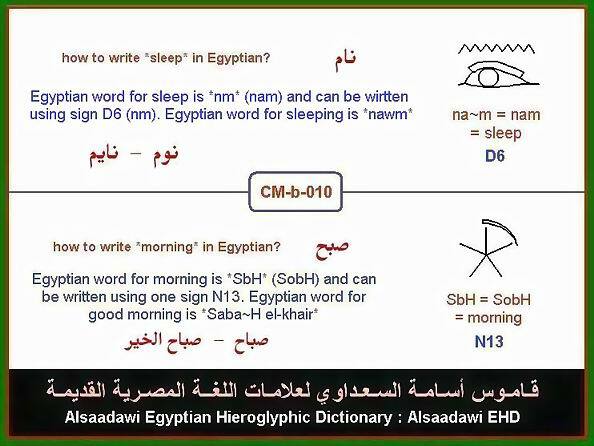 11. one should realize that ancient egyptian gods were wrongly deciphered by followers of champollion and the correct interpretations of the egyptian gods have quite different meanings! 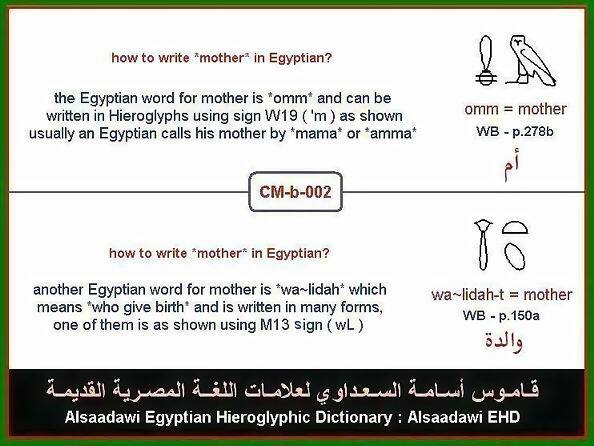 1. how to read or write the egyptian word for *father*? 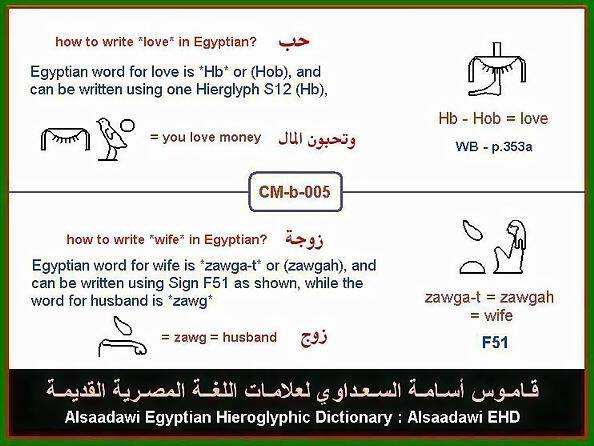 if you don't know the utterance of the egyptian word for *father* then you may find it in a good english-egyptian or english-arabic dictionary. 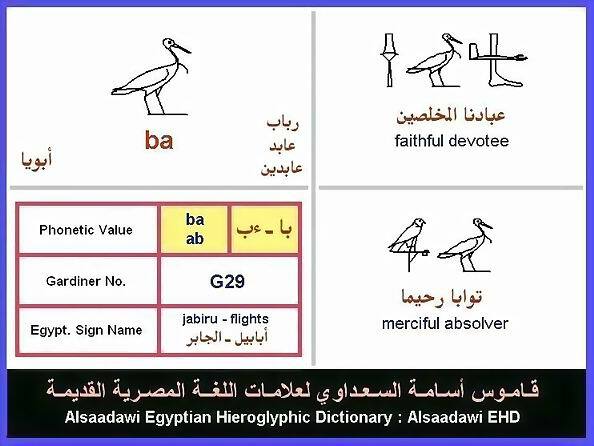 if you search for it you will find it as *ab* which means *father*. 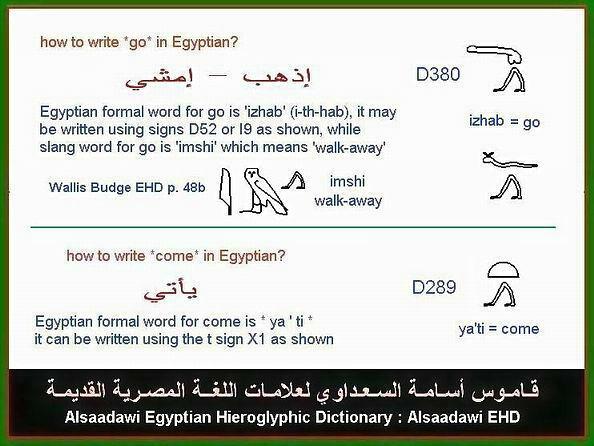 now how to write *ab* in egyptian hieroglyphs? 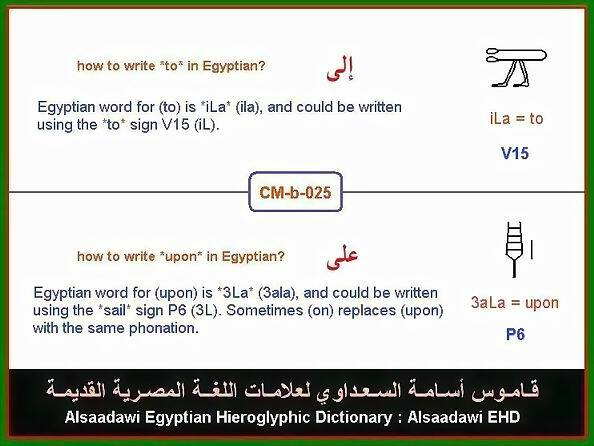 the word could be written also without the vulture sign G1 but it is placed here to ensure that word starts with (a) and not vise versa. 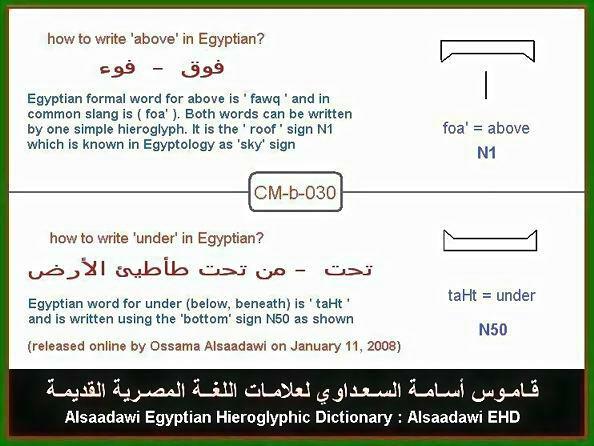 this word is the written egyptian word for father and reads as (ab) as shown above. 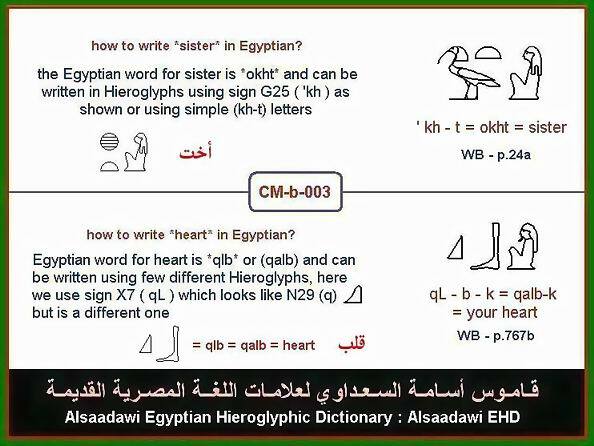 2. how to read or write the egyptian word for *brother*? 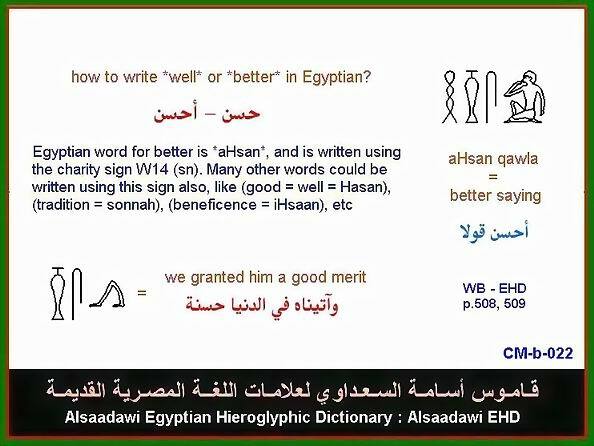 if you don't know the utterance of the egyptian word for *brother* then you may find it in a good english-egyptian or english-arabic dictionary. 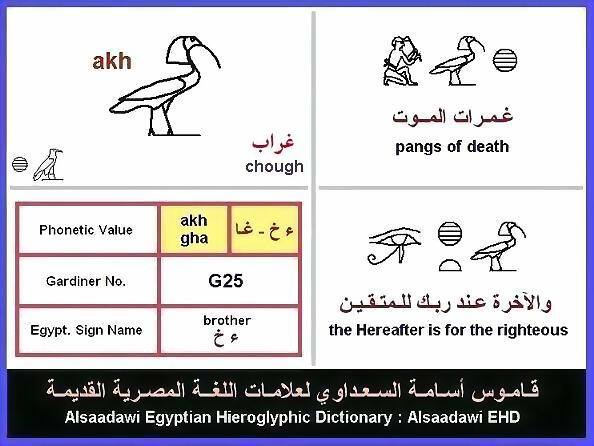 if you search for it you will find it as *akh* which means *brother*. 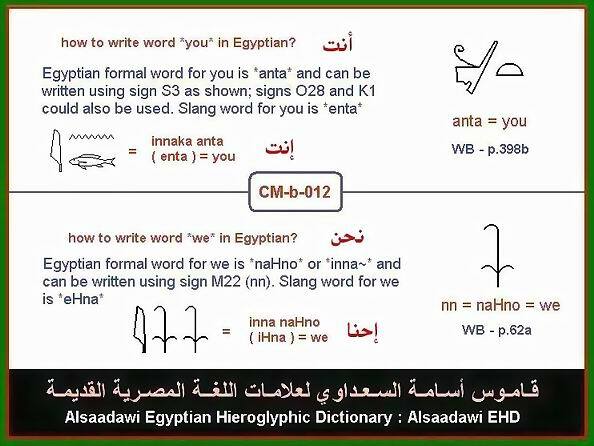 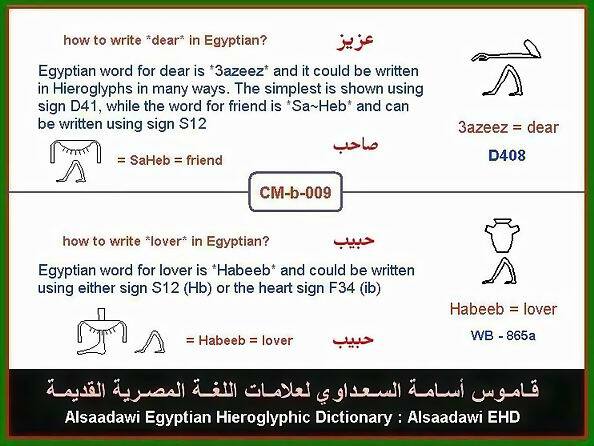 now how to write *akh* in egyptian hieroglyphs?